When installed correctly, the LED light will flash three times. Replace the battery cover. Five clicks of the power button turns it on or off. 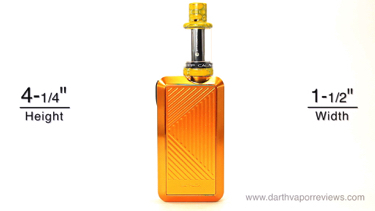 The LED light will glow orange while vaping. 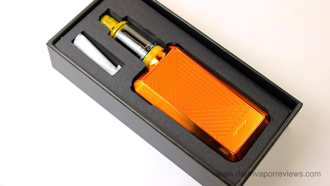 The Joye ECO D16 is a stainless steel, pyrex glass tank with a two milliliter e-liquid capacity. 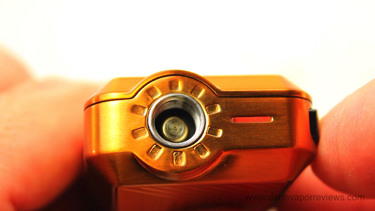 It comes with a pre-installed 0.5 ohm BFHN coil. It has a 510 connection with two air holes on the mouthpiece. * First device to use AA batteries. * Lightweight and stealth/pocket friendly. * Strong magnetic battery cover. 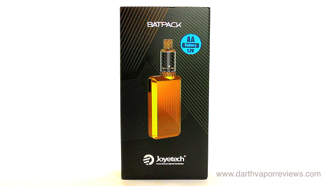 The Joyetech Batpack is a pocket sized mod paired with a mouth to lung tank all powered by two AA batteries. The kit comes in a cardboard box with a slide off sleeve. Inside the box is a User Manual, a Warranty card, an e-liquid coil card, spare O rings, a spare BFHN 0.5 ohm coil head and the Batpack with attached Joye ECO D16. 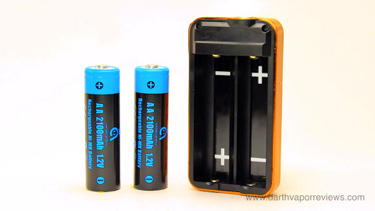 The Batpack is a compact mod powered by two AA batteries. 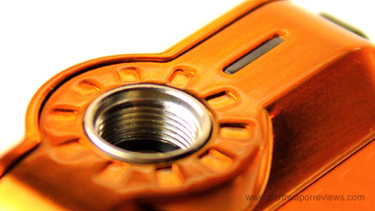 It is 510 threaded and comes in six colors. It only has a power button, LED light and a magnetic battery cover. It takes regular or rechargeable AA batteries. The Batpack comes with two rechargeable batteries pre-installed, but you will have to take them out to remove the protective tabs. It can be disassembled into four main parts for cleaning. Replace the coil by unscrewing it from the base and adding a new one. 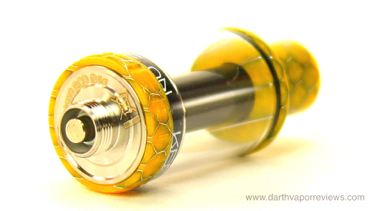 It features a honeycomb Delrin mouthpiece. To fill with e-liquid, unscrew the mouthpiece. Remove the pyrex glass tube. 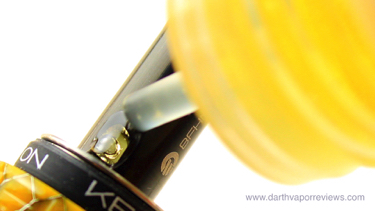 Prime the coil with a few drops of e-liquid. Replace the glass tube. 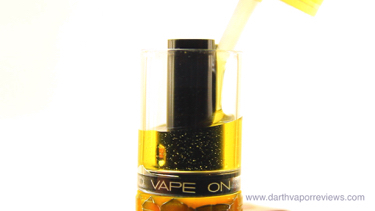 Fill with e-liquid. Replace the mouthpiece. Let it sit for several minutes to let the e-liquid soak in to the cotton wick. Most smokers know AA batteries, but not necessarily 18650's. If you use it with nicotine salts then it will last much longer because of the high nicotine content you won't have to vape as much. It's small so it fits anywhere you want to stash it and it's easy to use. Currently, the Batpack starter kit runs in the $40 range. If you would like to pick one up for yourself, just click on the links or the logo below. Have an excellent day and may the Vape be with you. 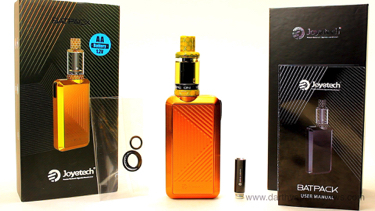 I do find it nice that Joyetech includes two rechargeable batteries with the kit. I use Amazon rechargeable batteries for various home electronics so I already have a charger, but the Batpack mod does not have a charging port so a separate charger would be needed. It would also be nice if it had color changing modes on the LED so you had an idea when the batteries needed changing. Another con is the Batpack mod can only be used with the ECO D16 atomizer so it restricts the possiblities of other tank/rda setups. Overall, I think this is a great kit for beginners. 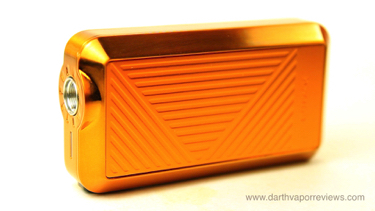 Attach to the Batpack mod and you're ready to vape. I found the Batpack to be a great starter kit for beginners. It's compact, lightweight and pocket friendly. the vapor production is decent and on par or greater than a cigarette. The obvious pro is it's the world's first e-cig to use AA batteries. Regular store bought AA batteries should last 150 puffs and rechargeable's are around 800 puffs. Because I made the mistake of using nicotine salt e-liquid for this review, I have barely put a dent in the battery life. 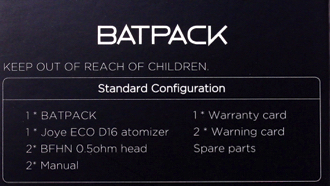 * Batpack only compatible with ECO D16. * No color changing LED.